Sevilla! a dramatic city if e'er there was one! The town of a barber, a trickster, and a cigarette girl. There will be a quiz at the end of the post. And yet...I'm not sure if I wanted to like Sevilla more than I did, or because I DID like it, but am simply unable to capture its beauty in photographs. In either case it was a slightly troubling beginning to the trip. Seville (I'll stop with the Spanish spelling now, though the Spanish pronunciation produces a more pleasant ring (say-VEE-yah - vs Seville - Seh-VIL). 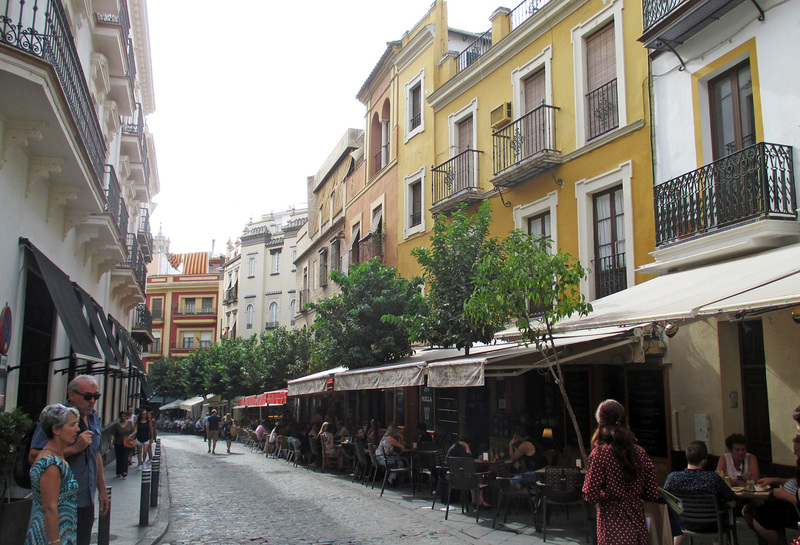 Seville is much more laid back than though nearly as busy as Madrid. To its great credit it has more eateries everywhere one turns than Madrid and most other European cities (many of which are no slouches as regard cafes, restaurants, etc). One block in particular stands out, not simply for the number of places to eat, but for the lovely trees sheltering much of the outdoor tables. It looked so appealing that I et my last big meal there, and loved it. 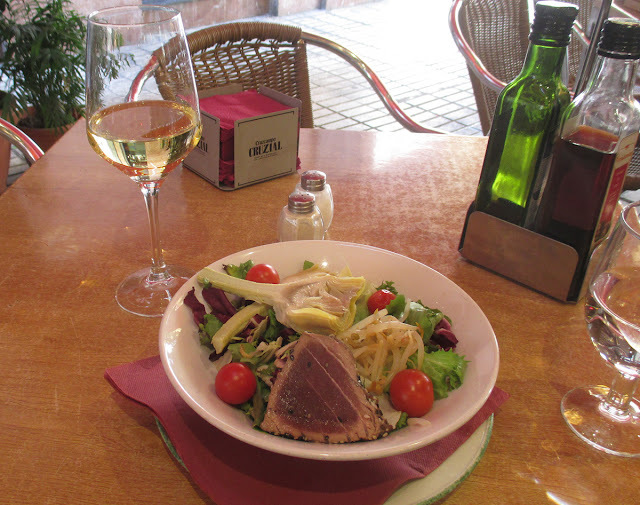 Shady or not, it is a pleasure to sit down and eat in Seville, preferably to sit down outside, which I did for every meal save one. Less than wonderfully re the dining al fresco experience here, there are more and more persistent beggars here than any place I've experienced in Europe. Even as I write those words I know that there is a horridly high rate of unemployment in southern Spain. And I have nothing against asking for money for food. But those who do it here continue to nag and persistent even after several polite uses of "No, gracias." 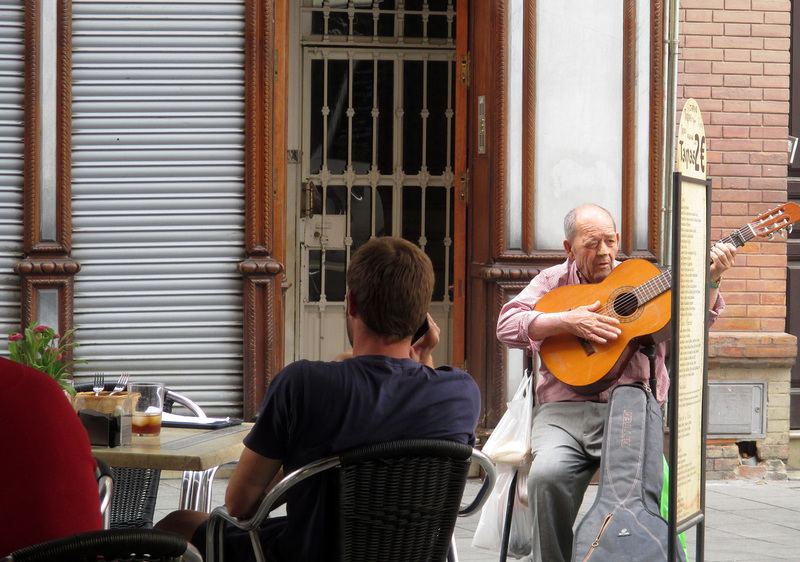 Street musicians also can be very pushy about asking, and continuing to ask, for money. An example of two very different approaches on the part of performers follows. At the restaurant I dined at one highly energized and terrific street singer went up and down the block in joyous song, and afterwards quietly visited all of the restaurants for which he had performed. Having realized that the fellow standing next to my table was the one who had just entertained me and made me smile, I readily gave him money. 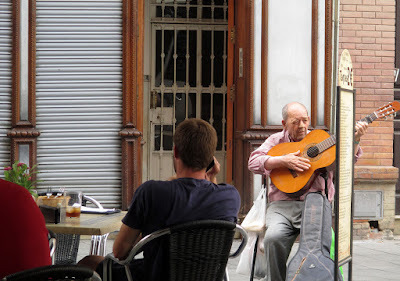 Almost as soon as he had finished, however, another musician imposed himself between my eatery and the next, standing almost atop all of my fellow diners and me. He suddenly burst out into loud, unpleasant song. I did not tip him even though (or perhaps because he stood and glowered at me even after I repeated "No, gracias" three times. I paused between each for effect, though neither pauses nor statement had any effect on him. reverence for its literary past, and as I wandered its very, very narrow streets, streets that seemed to wind any which way, I found plaques that honored other writers too, or characters in plays and novels. 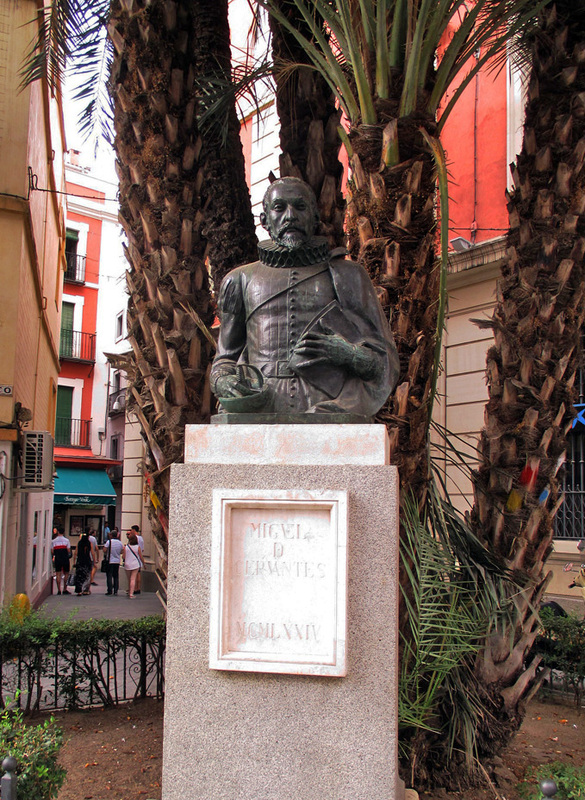 Did you know that Cervantes wrote plays? 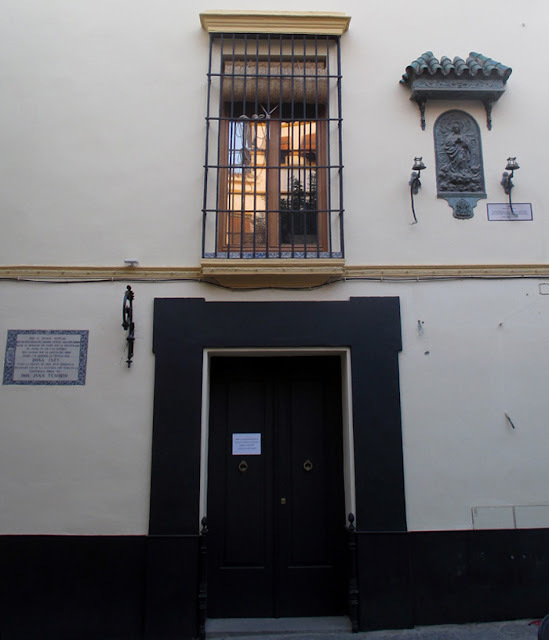 Many in fact, and he was mixed up in a long-term unofficial contest with Lope de Vega, one of the best and most prolific dramatic writers during Spain's Golden Age. Alas for Cervantes, Lope WAS the better playwright, and Calderon de la Barca, who came a little after, towards the end of the Golden Age, was as good as, some might argue better than Lope. So why, I'm only guessing but probably right, are you familiar with the name Cervantes, and not the other two? 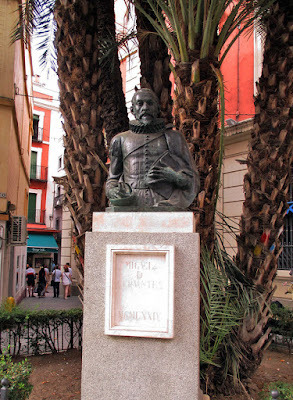 Because Cervantes wrote the amazing proto-novel Don Quixote. It is gigantic in length and gigantically ambitious, and it pays off. It's difficult to think of Spanish fiction taking the path it did had it not been for Cervantes. How many of you know it? Hmmm...? Raise your hands. Now, how many of you who raised your hands have actually READ it? Hands? Precious few, I imagine, and as already noted, I am seldom wrong in these matters. I myself read part one when I was very young. For some reason in my late teens I decided that I simply must read all the greatest novels - most of them Russian and all very lengthy. Don Quixote certainly fit the latter category. Also, the musical Man of La Mancha premiered the year I graduated high school, 1965. Not only did I WANT to play every leading role in Broadway musicals at the time, I rather foolishly thought that I COULD. I was soon brought down to earth - not smoothly, instead with many crashes and bang-ups. I picked up the book a few months ago, a part of my preparation for the journey. I admit I was impatient with the book one. Yes, yes, he tilts at windmills, yes, yes, Aldonza-Dulcinea. Though you know what? Neither Aldonza nor Dulcinea ever show up in the novel. Reasonable enough for Dulcinea, for as the song goes "she's naught but flame and air." But aside from three, maybe four mentions, NO Aldonza in Cervantes. Just so you know. Where the book is golden, is genius in my view, is in book two. Maybe another post on that at some point, but though the novel is a daunting 900 pages (in the Kindle version at least, and I must read books on Kindle these days because my peepers are almost shot), you WILL be rewarded. But of course you won't read it. Oh, you SAY you will, but you won't. By now you're muttering, "Long-winded arse-hole." And you're probably right. Let's get back on topic then, shall we? Easy enough to see the house, but the plaque? You know the Don Juan/Don Giovanni tales, right? 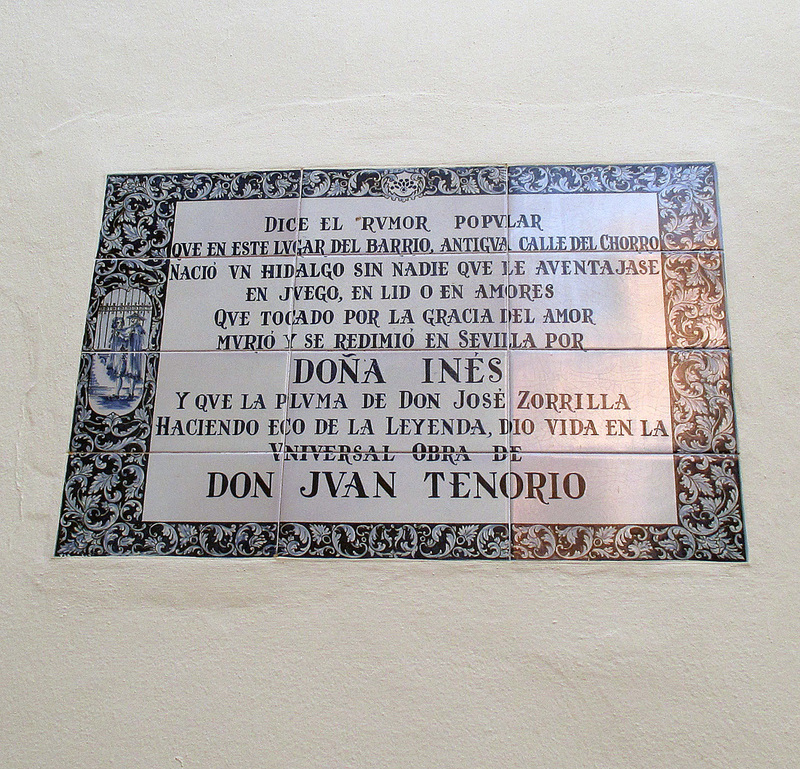 Who is Dona Inez? Dona Ana yes, Dona Elvira of course, but Ines? 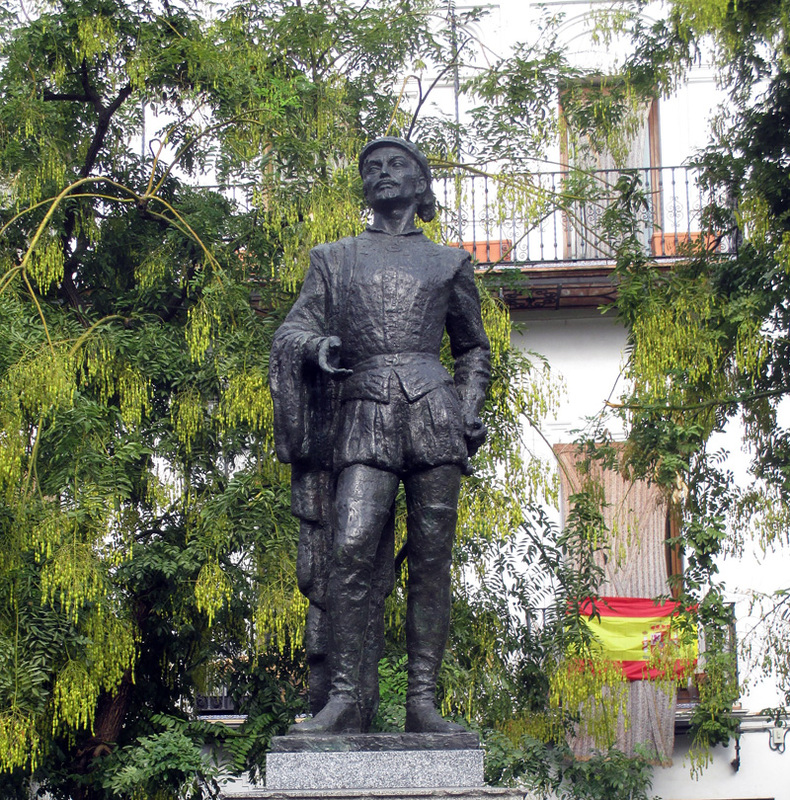 Tirso Molina created the character of Don Juan in his 16th century play The Trickster of Seville. Moliere penned one of my favorite adaptations, then Mozart wrote the great Don Giovanni in the late 18th century, and more and more adaptations followed. 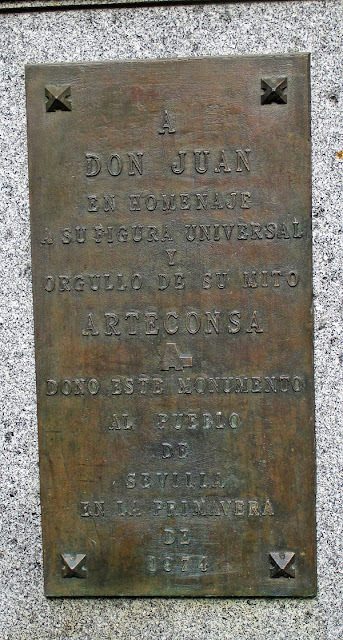 Including one in the 19th century by Don Jose Zorilla called Don Juan Tenorio. 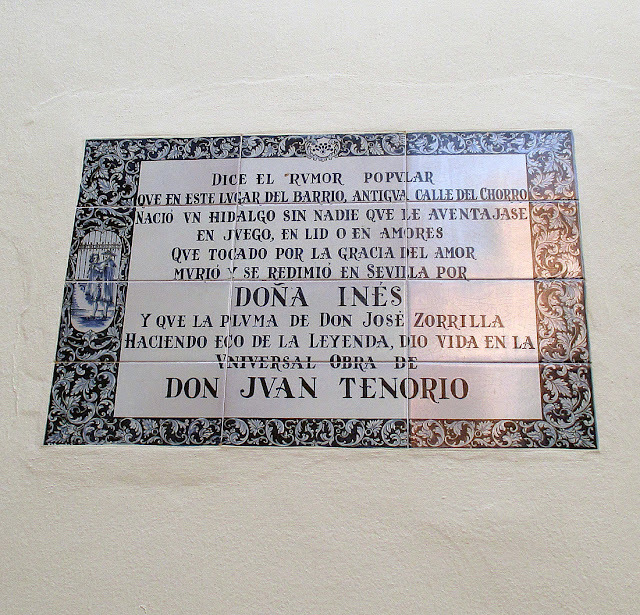 It is not nearly as well known in English-speaking countries as are Tirso's and Mozart's versions, but was and still is very popular in Spain, Zorilla's heroine is Dona Ines, a sweet young nun who is spotted and wooed by Don Juan. FEEEE-GA-RO! The Barber of Seville! Beaumarchais's play, one so popular that he wrote a second, The Marriage of Figaro (even a third play, not nearly so good as the first two so I won't comment more on it), is about France really, but it was (and may still be, who knows?) 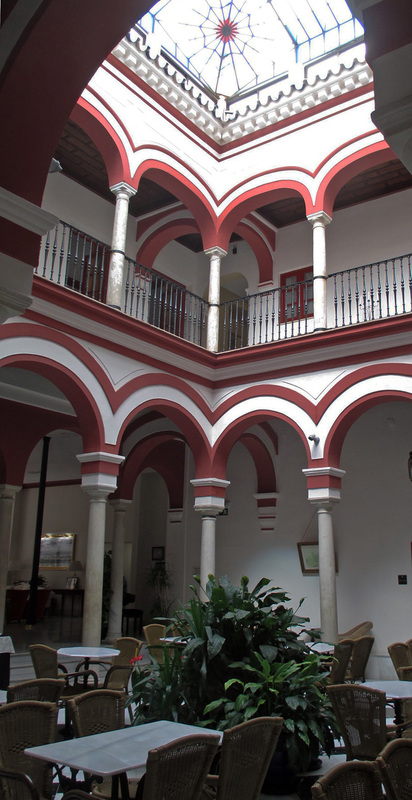 much safer when writing a comic critique on the manners of France to set what you're writing in another country, your neighbor Spain for example, and maybe in such a dramatic city as Seville. Aside: (as if most of this post is not an aside, or a collection of them). Both plays by Beaumarchais were operatized, Marriage of Figaro of course by Mozart again, and The Barber of Seville by Rossini. You see? The drama that one way or another comes out of this town erupts out in torrents. And I love that. So, there you have it. 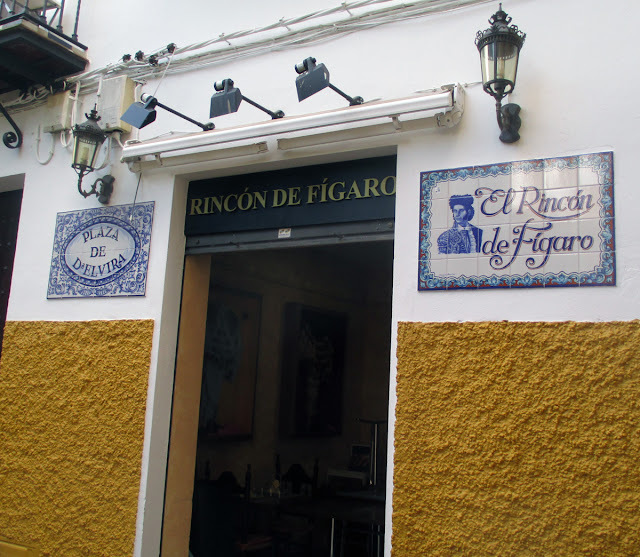 By the way, I'm not quite finished with plays and operas set in Seville, but I think I'll save the rest for another post. 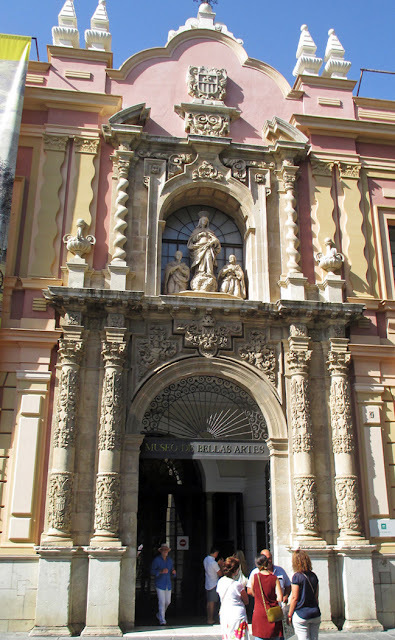 If there is anything more dramatic in Seville than its plays it is its religious processions. They are countless, I have read, and I was excited that I might see one until I also read that there were none to be had in mid-October. Well, I beg to differ! I encountered a huge tower. I had discovered quite by accident the most iconic building in the city. The Giralda. 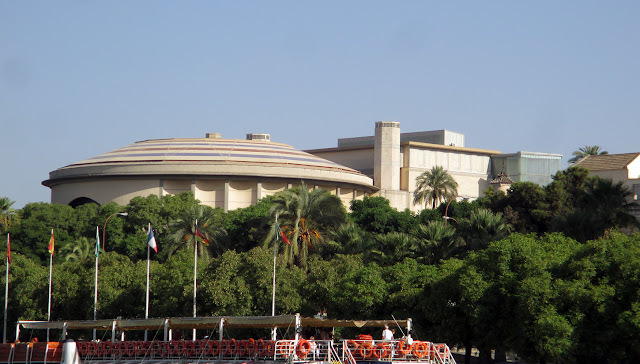 This amazing building was built by the Moors, and a beautiful sight it is. Of course the Christians, after they'd slaughtered the Moors, "Christianized" the tower - but at least they didn't tear it down, as they did to many beautiful Moorish buildings in Spain. 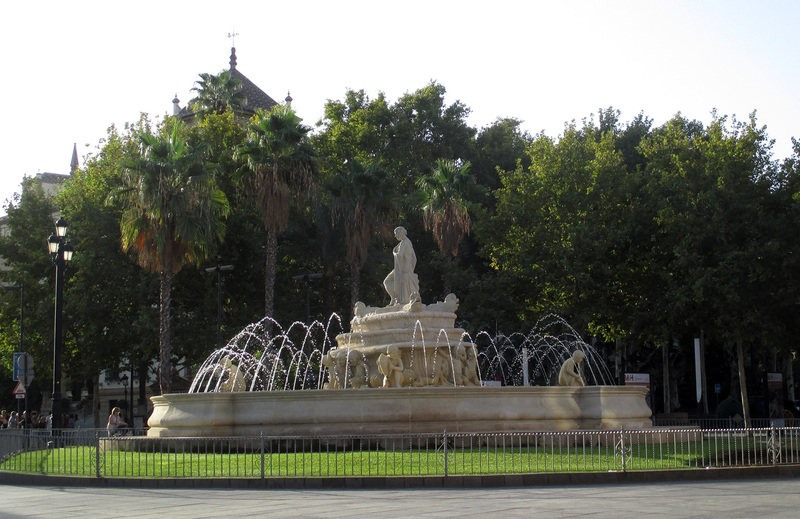 Anyone whose been to Seville (and who am I to talk? 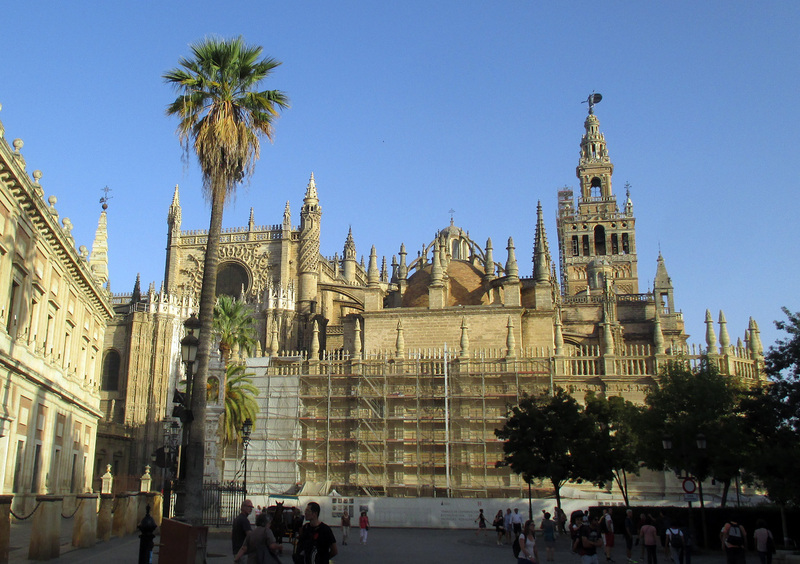 I'm 70 years old and only just got round to it) can tell you that the Giralda was re-designed slightly as a bell tower, to call the faithful to prayer. Ironic, yes? The Moors built a minaret next to a mosque so that a muezzin could run up it five times a day to call the Muslims to prayer. This unfortunate fellow had to have had very strong legs, or a mule, probably both. Where are bell towers set? Next to cathedrals of course, from which bells call the Christians to prayer. 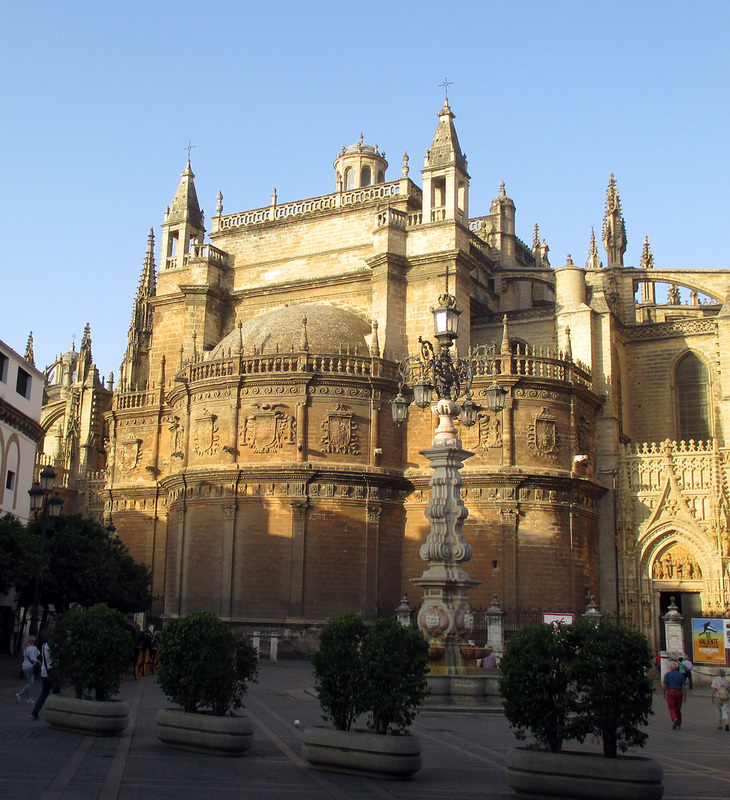 There there, looming less tall than the Giralda but more overwhelming was built the great Cathedral of Seville. 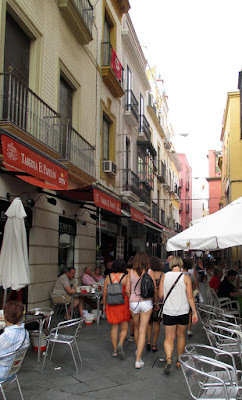 I couldn't get over the crowds that had gathered around Giralda and Cathedral. Is it always thus, I wondered? And then I heard a distant noise. Trumpets blaring out a somber, almost mournful air. It reminded me of the music in some of Fellini's films, scaring the hell out of young kids. Perhaps that's what you want to do with such music, scare the hell out of the kids so that they won't rot in hell. Anyway, the trumpets sounded louder and louder, people began to shove and crane their necks, and while I didn't shove (never, not I) I certainly craned and strained my neck. Sure enough, there WAS a procession. I was thrilled! If you look far enough to the left you will spot another banner well away from this one. Not sure if that was the end, midpoint, or where it was in the procession, and there were too many people crowded around for me to get closer, higher, or farther down the line. I only found out why there was a procession on this day when I returned to my hotel. The very nice young woman at the desk told me that it celebrated the Coronation of the Madonna of Health, their Madonna of health. I didn't know there WAS a Madonna of Health, but I was very glad for her, because, as little of it as I saw, I had my own procession! I returned to my hotel - a very pretty one - and rested well. 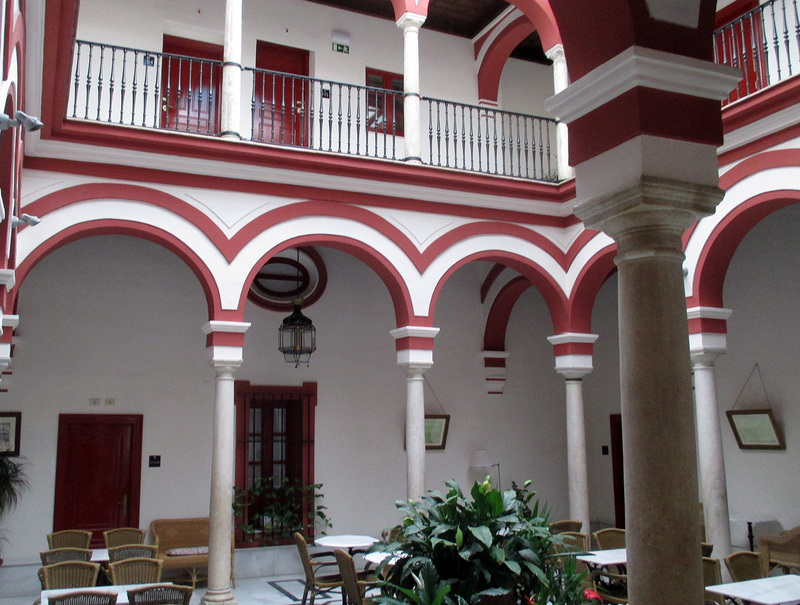 The above shows the courtyard in which we ate breakfast. Below, a different angle, and if you look carefully, mostly hidden behind the large gray column on the right, a wee bit of the door to my room. LOVE being so close to breakfast! and after a longer stroll, the Rio Guadalquiver. This fine river was, many many years ago, more mighty than it is now. 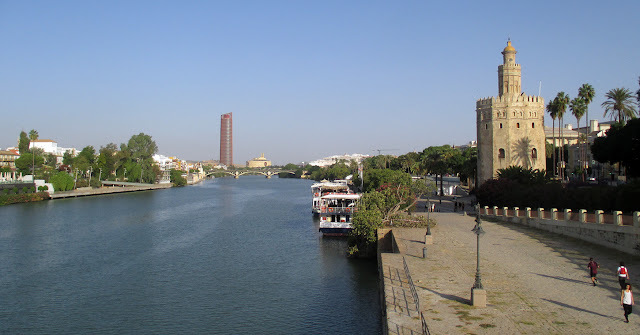 In fact before it silted up it went all the way to the sea (that's a lot of silting) so that once upon a time Seville was an important port city...until the silt. At 11 am I took the river cruise on the river, the first of several a day. Let me just say here, for any of you thinking of taking the 15 Euro cruise, it's not a complete waste of time, but not really worth the time or your money. Because of the Giralda, very much as in Washington DC and the Washington Monument, no building in the center can be taller than that former Moorish, now Christian tower. Some evidence above. While the small tower on the right, the 13th century Torre del Oro, may look at first glance taller than the one in the distance on the left, it is not. It is nowhere near the height of the Giralda in fact. 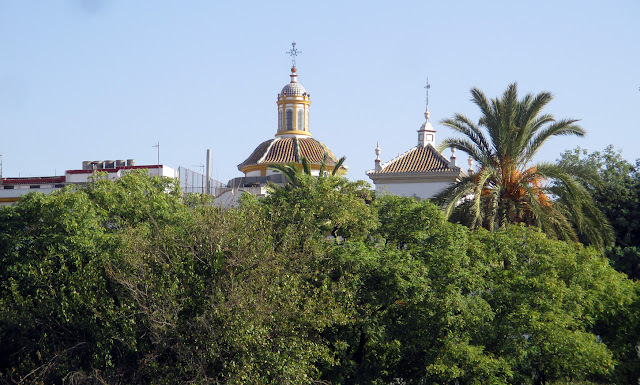 Apparently that distant tower, named the Seville Tower, is far from the center of town. And the EU, which is very strict about such things, made a lot of trouble for Seville when even a tower so distant from center was built. Since no building in center is very high, you don't really see much on the tour. You can make out the top of the opera house, the top of the bullring, one or two other partial sites of some importance. It's very pretty on the cruise, however, and quite cooling. The temperature rose to 90 degrees that mid-October day, and I was grateful to be not on my feet and out of the heat for a tad less than an hour. True to form for this supposed "compleat" traveler, I ruined the effects of the cool river cruise by insisting afterwards on finding the Museo de Bellas Artes, and losing my way in more ways than I care to count or tell you before I finally spotted it. Afterwards, I am extremely sorry to confess, I lost my way again and was a hot, sweaty mess by the time I found the neighborhood of my hotel. Also starved. By luck I found a place, non-descript looking but with a very good menu just a block or so away from the hotel. If Tuna belly does not sound appetizing to you, belay your fears. The salad and the wine that went with were excellent! Sushi-grade tuna, and note the beautiful artichokes. I sat in the shady area depicted in the right on the photo of the bar, and was extremely well fed and cooled off when I left. 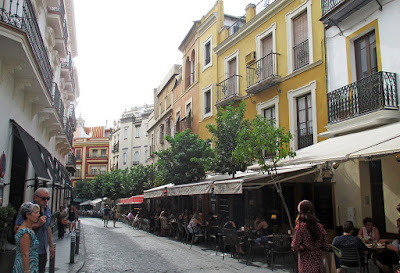 Thus ends the story of my first two days in Seville...stay tuned for a wonderful day trip I took on the third!